Our giant muffler arrived the other day from Summit Racing. It doesn't have any ends on it so you can look right through it, or not through it but as far as the baffles. It's heavier than our current muffler and looks very quiet, at least to our untrained eyes. It turns out we will have to weld ends onto the muffler, assuming we can find some. We're thinking we could cut the ends off our little muffler and weld them on the big one, if that's at all possible. I'm not sure why the manufacturer didn't weld ends on themselves, unless they mistakenly believed we knew what we were doing. 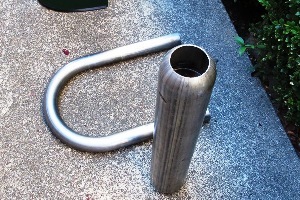 We also ordered a length of mandrel-bent 1.75" exhaust tubing, which we plan to use to run a path from the old exhaust pipe to the new muffler. Although we're still trying to imagine how that's going to work. 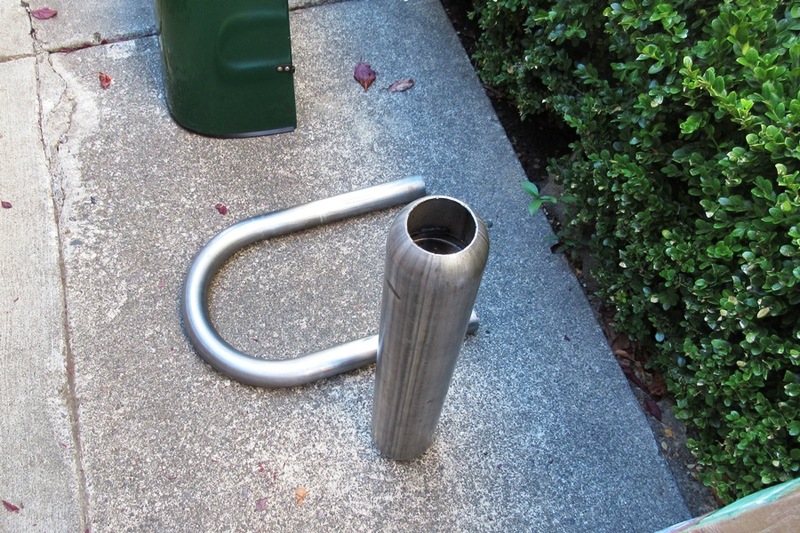 We also hope to use some of the mandrel tubing for a new exhaust tip, since our blingy chrome tip hasn't really grown on us, not even a little. It doesn't look good in photographs from any angle, or in person. It's changed the exhaust note slightly, and not in a good way. We're kind of looking forward to getting rid of it. 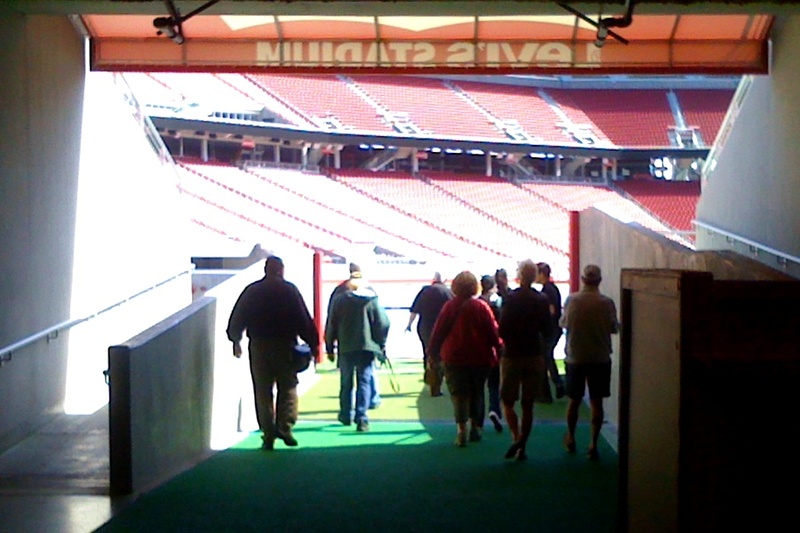 Our Locost was invited to participate in a pre-superbowl celebration at Levis Stadium in Santa Clara, CA, home of the San Francisco 49ers and venue for next year's Superbowl 50. 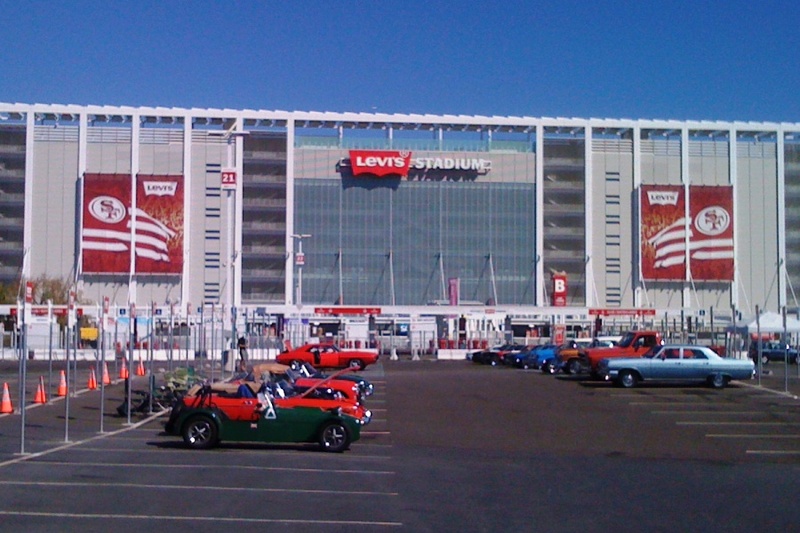 The event was held on a Saturday, almost four months before the actual superbowl, and for some reason the 49ers felt a classic car show should be part of the football festivities. This makes sense if you keep in mind this is the same 49ers organization that took a conference-winning team from three years ago and turned it into the disaster it is today. The car show wasn't a disaster, but it was close. Only about 30 cars showed up—our half dozen M.G.s, a dozen or so old T-birds, and a smattering of Mustangs and Chevys. Not that anyone noticed. The general public spent the day inside the stadium complex, and at no time during our tour of the facilities did we ever see anyone out in the parking lot looking at cars. We did have to pay to enter, which should've made the car show official, except that everyone else had to pay too, even people without cars. Obviously the 49ers have a thing or two to learn about car shows. Overall, we enjoyed our visit. 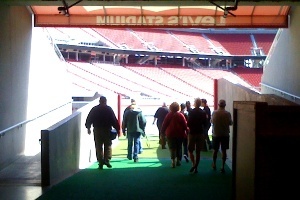 We got to spend a lot of time in the 49ers impressive museum, and had a chance to go down on the field to experience the perspective of coaches and sideline reporters during a game. 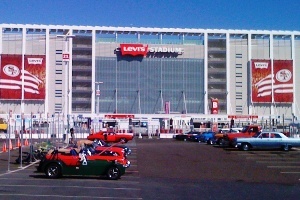 So despite the limited car show attendance, the pre-superbowl celebration itself turned out okay, and we expect the actual superbowl to be even better, if for no other reason than it'll mark the first time in the short history of Levis stadium that two good football teams were on the field at the same time. 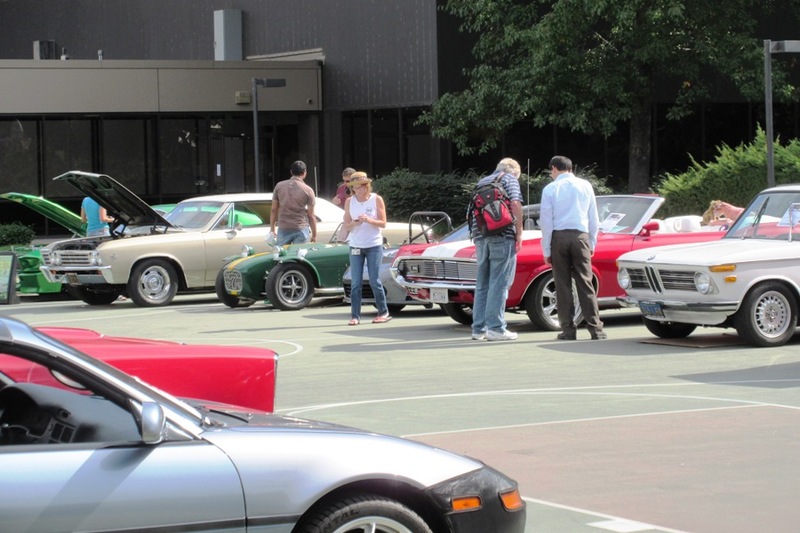 Soon after that event, we found ourselves at yet another car show, this one hosted by our company at our Roseville office. They do this every year, a friendly competition to see which car employees like the best. There's no entry fee, so it's not official, but we did manage to field eighteen cars this year, a company record. The winner was some kind of Mercedes truck, and the runner-up was a lime green Mustang with a giant stereo system in the trunk. Clearly our employees are not car people. Although we kind of liked the Mustang, too. Except for the stereo. We're a little concerned now about all of these car shows. We don't want anyone getting the idea that we might be car show people. We still do a lot of driving, tons of it as a matter of fact. Of course a fair amount of it's commuting, and even a few trips to the grocery store, but mostly it's all very spirited group drives with our local British car clubs. Very spirited. Unfortunately these events don't seem to make it into our blog on a regular basis, or any basis, and we're not sure why. It could be the lack of photos again. We'll have to make a more concerted effort there. For some reason summer is having a hard time calling it quits this year, and we're still driving around in too much heat. Because of this we decided to re-install our oil cooler, which of course doesn't keep us cool at all, but anything we can do for the oil is a bonus. We bought new rubber hoses from Moss Motors, and this time we routed them around most of the framework and clutter in the engine bay. Although not all of it, so we did have to protect some parts of the hose with sections of even bigger hose, like we did before. One thing we found out last time is that any part of the hose that remains in contact with sharp edges of the framework or engine bay clutter will chafe, and eventually leak. We're not sure why the protective hoses won't chafe in the same manner, but maybe they will, so we'll probably have to check on them from time to time. 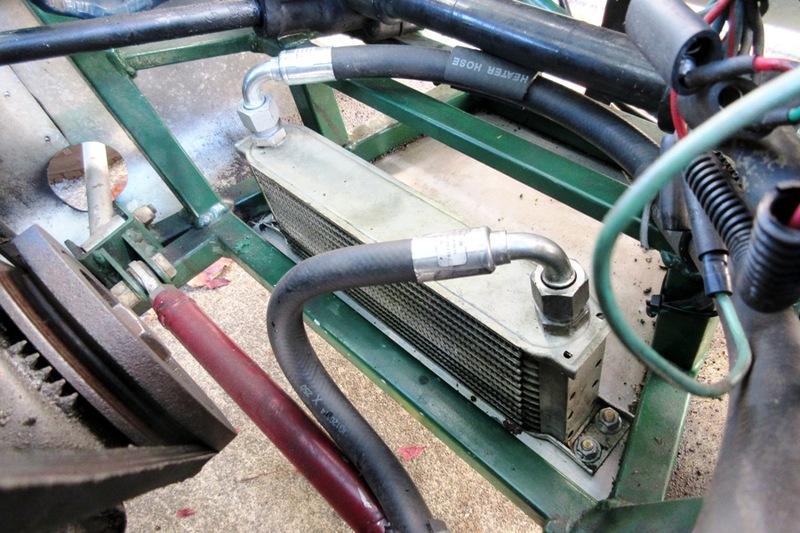 The good news is, the oil cooler doesn't leak, and it increases the capacity of the system to a full five quarts, so the oil doesn't get as hot. 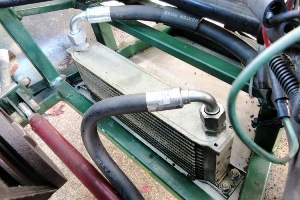 The cooler itself may also provide some help there. Oil pressure is up a few psi, always a plus.